VRLA AGM: design life 7-10 years. The AGM range of batteries has very low internal resistance making them particularly suitable for high current discharge applications such as for inverters, thrusters and winches as well as engine starting. 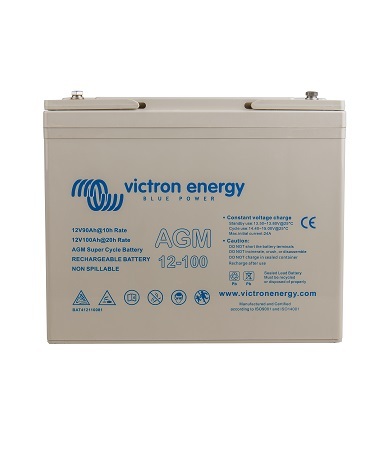 The use of high purity materials and lead calcium grids ensure that AGM battery products have particulary low self discharge so that they will not go flat during long periods without charge. AGM deep cycle batteries are supplied with M8 drilled, flat copper terminals ensuring best possible connection contact and eliminating the need for battery terminals. The batteries are compliant with both CE and UL specifications in ABS fireproof containers and come with Victron's 2 year world-wide warranty. The paste of the positive plates is less sensitive to softening, even in case of repeated 100% discharge of the battery and new additives to the electrolyte reduce sulfation in case of deep discharge. Ideal for applications where deep discharges are frequent. Use the options in the dropdown menus below to select the DC Voltage, Amp Hour Rating and Battery Series required. Click on the “ADDITIONAL INFORMATION” tab below to see the available options for this product. 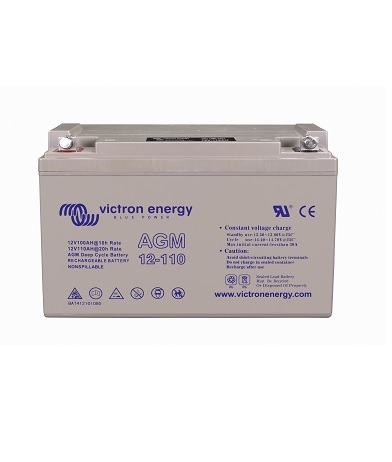 AGM Deep Cycle Batteries from Victron Energy. Available in Amp-Hour ratings from 8Ah to 220Ah. Suitable for use in applications requiring long lasting battery storage such as in renewable energy systems including wind turbines and PV solar panels, off grid systems, battery backup systems, and many more.